Have you ever dreamed to sleep in the universe with the hug of stars? This projecting light will create planet and universe atmosphere on your wall and ceiling. With this awesome light, you can experience the feeling of being in galaxy. Button A: press this button, it will provide 6 modes. Button B: press this button, it will provide three degree of brightness 5 50 100 . Press it for long, the light will rotate. Two methods of electricity supply, USB connection or batteries. 1.Place 3*AA batteries in . 2.When use as a night light, you need to cover the acrylic shade. Remove the shade, then it will be used as a projector. 3.Room of the best size 180 sq.ft and 8 ft hight. Multifunctional--The light can be used as a projector when removing the shade and can be used as a night light when it it with the shade. Three Optional Films---with three different theme: Magical universe, Starry star and Happy Birthday. Thus beautiful light will be projected to ceiling or wall, and press the button B for 3 second then the light will rotate. Convenient--- two methods of electricity supply:3* AA Batteries or USB connection. Satisfaction Guarantee--We provide 100% refund guarantee and if you are not satisfactory with our projecting light we will provide fully refund or free change. This is totally free risk purchase! 100% GUARANTEE We aim to make you happy with your purchase. If you're not satisfied, then CONTACT US and we will give you a 100% refund. 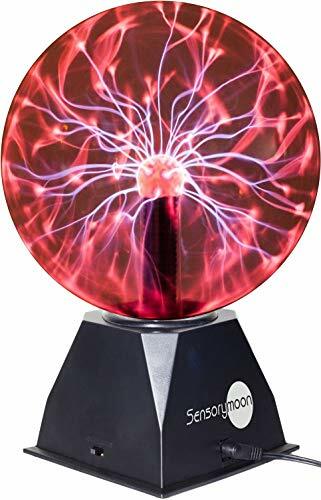 SensoryMoon is proud to include our new 8" large plasma ball: the perfect holiday or birthday gift for budding little scientists. With a high quality hand blown glass sphere, a stylish black base, and a 3-foot long power cord, our Tesla coil ball generates harmless streams of glowing electricity that capture and hold the attention of anyone watching. The mesmerizing lightning tendrils dance inside the inert gas medium, taking on colorful shades of pink, purple, red, and blue and even brightening to follow the fingertips when the plasma globe is touched! Our decorative plasma lamp also comes with a reactive audio setting that responds to loud sound or music, making a perfect addition for home entertainment or parties. Perfect Balance of Size and Performance for Price. One of the biggest regrets people have when buying plasma lightning balls is buying a lamp size too small. On the other hand, larger static electricity balls quickly become prohibitively expensive because of the physics involved. At just under the size of a professional soccer ball, our electric ball gives the ideal combination of sensory interactivity and affordability - providing hours of addictive entertainment for you or your kids. True 8" Ball Diameter. Other companies online can be deceptive about the nebula plasma balls they are selling. That's because the "8 inches" they advertise does not refer to the ball diameter, but the length of the plasma ball lamp including the base. Rest assured knowing our plasma spheres measure a whopping 20 cm, or 7.87 inches, in ball diameter. A Captivating Educational Toy. A perfect gift for the inquisitively minded, our plasma globe offers a safe and fascinating way to demonstrate how lightning works. And because static balls are so interactive, nothing demonstrates the concepts of potential differences, ionization, and the 4th state of matter - plasma - better! TRUE 8 INCH BALL DIAMETER FOR AN IMMERSIVE SENSORY EXPERIENCE. The first thing you'll notice when you pull your new plasma ball lamp out of the box is how substantial it feels in your hands. That's because unlike smaller electric globe toys, our large plasma dome light is designed to provide a highly visceral and interactive lighting experience - all at a price that doesn't break the budget! SPARK YOUR STUDENTS' INTEREST IN SCIENCE. Our plug operated lightning spheres uses a Tesla coil to generate a potential difference between it and the surrounding gas-filled globe. The result is a mesmerizing static electricity display that responds to both hand touch and speaker sound: and a fascinating way to demonstrate the concepts of voltage, current, and lightning without compromising anyone's safety. THE PERFECT GIFT FOR CHILDREN OF ALL AGES. Finally, buy your kids or grandkids a gift they won't turn off until their next birthday! Our nebula nightlight will make your little budding scientist the envy of all his or her friends. And since it's backed with a 90-day unlimited warranty, you can feel at ease knowing you are purchasing one of the best static electricity orbs around. BRING BACK CHILDHOOD MEMORIES. Take a step back into the disco era with these decorative hand energy ball generators. Watch as colorful streams of lightning dance across the hand-blown glass surface, electrifying any room in the house. And because its tendrils converge to your fingertips and become brighter when touched, our retro thunder ball toy will provide hours of addictive entertainment. SPELLBINDING IN THE DARK. Our electrostatic plasma lava lamp is dazzlingly bright under total darkness. Your child will be mesmerized by the impressively vivid streams of reddish-purple light, and will love playing around with the reactive audio setting. Large electron bulbs make the perfect night light for any kid's bedroom or decorative prop for your dorm room or office! 6)An attention grabber and draw eyes as the apex of your wedding, party, special event, etc. Eco-friendly at LED+Silicon Strips+ABS:The neon lights signs use LED at low voltage and energy saving, providing just right light output for room decoration.Made of flexible silicon LED strip lights and acrylic back plate,It is hazard-free, No risk of glass breakage or leakage of hazardous materials. 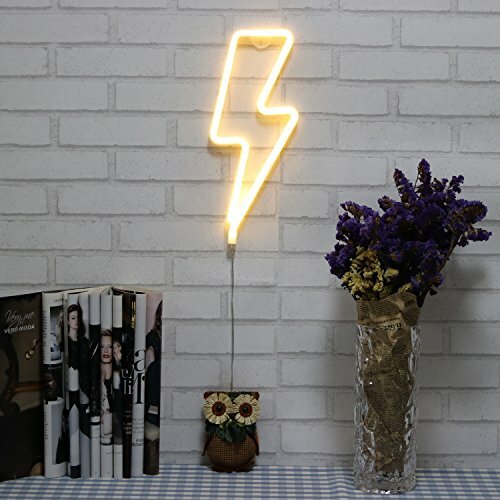 Bring More Fun to Life: Integrated hanging hook holes for ease of display on wall or just rest on mantle, self, table or dresser.With comfortable warm white light output,lightning bolt neon night light is an ideal eye catching to your home decor or party,making the simple life more colors and funny. A beautiful and practical night light, making for a gift filled with love. Our design philosophy is one of simplicity, security, and comfort. We pursue product designs that achieve perfection both as a whole and in every detail. 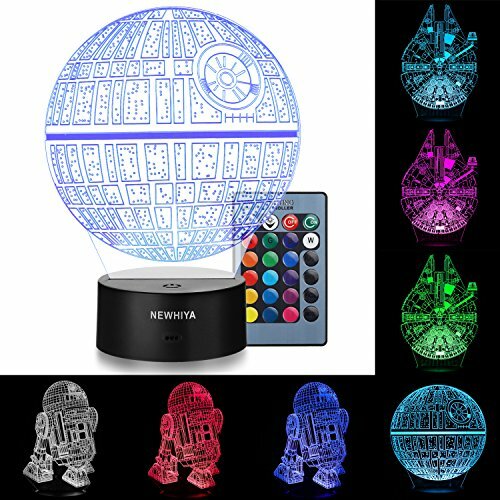 With this star projector, you can feel the starry sky in your home, and will begin to look forward to nightfall even more! Nursery room, bedroom, as a party decoration, or for creating a more romantic atmosphere on special occasions. Useful for those who suffer from insomnia or distractions while trying to sleep. Birthday and baby shower gift.
. Hollowed-out star-and-moon design for higher-resolution projection. High-power LED light bulbs, for projection from distances up to over 32 feet.
. Cute design, with piano paint + full-body UV craftsmanship, permanent shine, won t scratch or chip.
. 9 different light settings, including warm white, blue, red, and green. Can select a single color or multiple at once.
. Multi-functional remote control - Includes buttons for the power, timer, light settings, rotation, and music.
. Silent rotation - Starry night light makes no noise when operating, so it won't disturb you in your sleep.
. Plays music from memory card (supports hot swapping), high-quality speaker for enjoying the pleasant sound of a lullaby without the need for a third-party electronic devices. Product includes complimentary 128M memory card pre-installed, so you can play and change music as soon as the product arrives and is powered on. You can remove the memory card to add music of your own preference, just copy your music over to the memory card and place it back into the night light. Memory card removal: use your fingernail or a flat, hard tool to press the bottom of the memory card into the night light, once the card has been unlocked, it will automatically pop out. 2019 NEW MODEL - Remote control star projector, powerful functionality, high-resolution star and moon projection, global design patent. 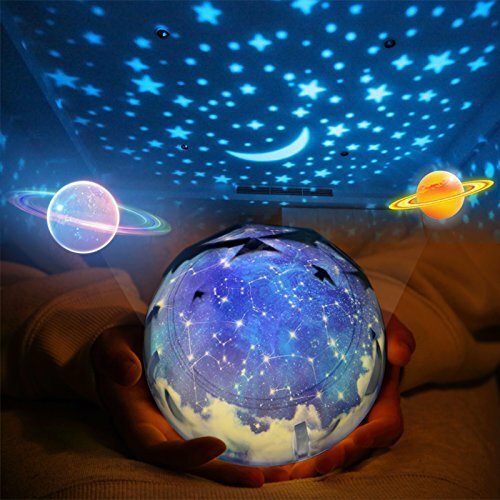 Genuine star night light projector, a gift that everyone is crazy about! Silent 360-degree rotation design with 9 different lighting effects. REMOTE CONTROL AND TIMER - Can be remote-controlled from a distance of up to 32 feet. 5 to 999-minute timer switch, blue LED digital display that won't hurt your eyes in the dark. MUSIC - Built-in 128M memory card (removable), comes with 12 different pleasant tracks that will put you right to sleep. High quality speaker, so that you can enjoy the beauty of the starry sky along with the pleasures of crisp sound. 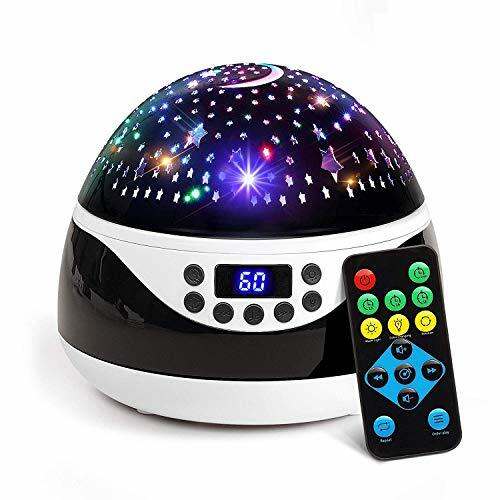 WHAT YOU GET: 1 x star night light projector, 1 x 128M memory card (already installed), 1 x USB cord, 1 x instruction manual, 1 x after-sale service card, 1 x beautiful package, 30-day worry-free money back guarantee! 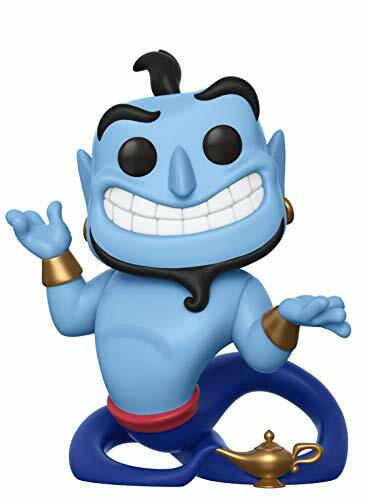 From Aladdin, genie with lamp, stylized as a pop! From Funko! Item stands 3.75 inches and comes in a window display box. Collect all items from Funko! From Aladdin, genie with lamp, stylized as a pop! From Funko! Item stands 3.75 inches and comes in a window display box. Collect all items from Funko! 6.PMMA acrylic is not glass, the whole board is solid acrylic material. Strong, hard, high toughness, not fragile, will not hurt the child; Laser engraving technology never fade. Touch Control: red, green, blue, yellow, cyan, purple, white, color changing. can fixed one color or 7 color gradual changing. Durable base in which there are 10 LED beads, powered by 3-AA batteries or 5V USB Cable connected to PC or your home adaptor. The Perfect Gift:simple and stylish design,suit for birthday,anniversary,housewarming,graduation,engagement,valentines,romantic time and many other special occasions. Perfect decoration for bedroom, child room, living room, bar, shop, Cafe, restaurant, and anywhere you like. NOTICE: 3D just Visual Effect, the lamp itself is Flat Unique Lighting Effects Amazing Optical Visual Illusion Home Decor Lamp. If you have any questions, please contact me and I will deal with them in time. A SIMPLE BUT INTERESTING ROOM DECOR AND GIFT FOR GIRLS & BOYS! LIGHT UP YOUR ROOM! 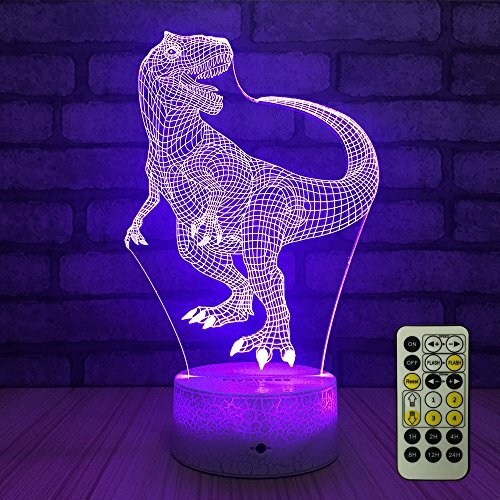 When you use the cool nightlights as ROOM DECORATIONS, it will take the guests' attention and start an interesting topic about the 3D effect! AWESOME DECOR FOR BIRTHDAY PARTY! COLOR YOUR DREAM! When you take it as NIGHT LIGHT, you can set the color you prefer, then the lamp will guard you all night and lead you a colorful dream! IDEAL AS A BEDSIDE LAMP. COLLECTIONS FOR GIRLS, BOYS, KIDS, HORSE FANS! Q: Why only some colors work after a few days? A: With the USB cable included, you can plug it in with a 5V USB port, such as computer/ power bank/ 5V plug, as usual phone socket works well. When it happens only red and green colors could work, it means it's LOW VOLTAGE, pls replace the batteries (only some types support) OR change the USB port you are using. Q: Why the 3D effect is not vivid? A: First, please remove the protective films on both sides before use. Second, We suggest you to put it in a dark room so that it will show a better 3D effect. You know, it's a night light. Third, just as we say, it's an optical ILLUSION night light, From afar, you will see a 3D effect, but as you get closer, you will see a 2D acrylic plate. It's bound to dazzle and impress your friends! 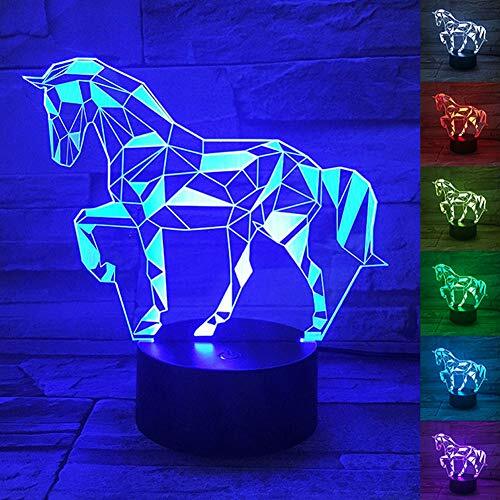 GORGEOUS 3D EFFECT: The 3D horse nightlight plays trick on your eyes, it is a FLAT 2D ACRYLIC PLATE actually, but it shows the VIVID 3D ILLUSION EFFECT IN DARK NIGHT! Ideal as a bedside lamp or on a windowsill in a kids bedroom! EASY OPERATION: There is a sensitive button on the base, touch once, light it up; Touch again, turn it off. Color changes in order when you touch the button: Red - Green - Blue - Yellow - Cyan - Purple - White - All Colors Flash Through a Cycle Automatically! ENERGY SAVING & ENVIRONMENT FRIENDLY : No contain pb and hg, green lighting. With high quality LEDs of 10,000 hours lifespan, it offers soft and uniform light, no dazzling, harmless to children's eyes! IDEAL USE: The Jigsaw Puzzle Horse nightlight can be used in Bedroom, Bars, Clubs, Classroom, Housewarming Party. Ideal gift for Girls, Boys, Women, Horse Lovers, especially a HORSE BIRTHDAY PARTY DECORATION, a great complement to any nursery which will create a vivid lighting effect. WARRANTY: WANTASTE is a registered brand from WANNET. We Stand by 100% quality of our 3D night light. Each nightlight is thoroughly tested before we put our name on it. We offer a full 180-day 100% money back guarantee. Pls do not buy WANTASTE products from other sellers.